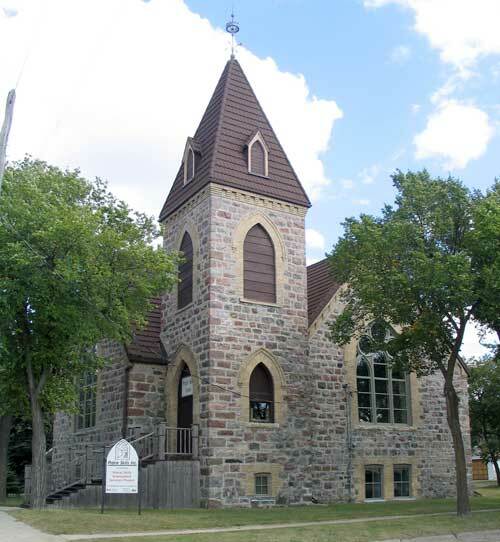 The Deloraine Presbyterian Church, like many other places of worship throughout southern Manitoba, has had a checkered career, serving successively as a centre of worship, recreation, education, and administration. It was raised to the Glory of God in 1896, and its sturdy fieldstone walls stand as straight and true today as when they were originally built almost eighty years ago. The building of the church was a labor of love on the part of the parishioners. The local people gathered the stone and drew it to the site. There it was trimmed and "squared" by Samuel Jones, a stonemason, with the help of others. The woodwork was done by Peter Laird and William Snider, and among the oldest residents in town today there are some who think that these two men drew the plans as well. In any event, the plans, if they still exist, have disappeared. The style is what architects call simple neo-Gothic, but to use a western localism, it is "Prairie Gothic." The edifice preserves the lines of the small meeting places - chapels and tabernacles - of the Methodist and Presbyterian churches of rural Ontario, and these, in turn, were modifications of the "nonconformist" architecture of rural England and Scotland. The lines of the exterior - walls, roofs, windows, and spire - point sharply upward, and in reaching heavenward, they seem to be as architecturally unyielding as was John Knox theologically. The church was used exclusively by the Presbyterians for twenty-one years, from 1896 to 1917. In the latter year the Methodists and Presbyterians in Deloraine joined hands - a local union of sorts - which came to head eight years in advance of church union (The United Church of Canada). Services thereafter were held in the Methodist Church, while the Presbyterian Church stood empty for several years. Later on it became the centre of new activity, being used for concerts, meetings of the C.G.I.T. and Tuxis Boys, and for Physical Training. Later on it was used for badminton. In 1935 Deloraine High School was destroyed by fire, and several years later the Presbyterian Church was purchased by the School Board and converted into a collegiate. This was named "Falconer Collegiate" in honour of Thomas Falconer who had served continuously on the local school board for twenty years. In 1959 an addition to the elementary school was completed and this made room for the High School classes. Once again the old church was 'scant. Four years later, however, and after extensive interior renovations, the Municipal Offices, Council Chamber, Civil Defence, Weed Inspector's Office - and the jail were moved into the old but well preserved building of hallowed memory. The checkered career of this church is not unlike that of many others in small towns across the west, whose conversion to other purposes followed church union, shifts of population, changing local fortunes, and the passing on of the pioneers. Some of these old churches in towns adjacent to air stations under the British Commonwealth Air Training Plan, became recreational and social centres for young men from Britain, New Zealand, Australia - and Canada during World War II. 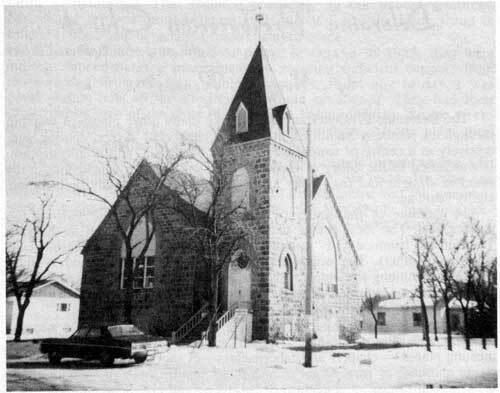 Deloraine Presbyterian Church building, as it appeared in 1960s or '70s. Deloraine Presbyterian Church building, August 2007, now the home of a human resource development centre. Nonetheless, those who built Deloraine Presbyterian Church, and those who raised others like it, gave of their skill, labor, and devotion that they might praise God after the custom of their forefathers. So they paused in their struggles against nature and raised up their places of worship, many long since gone. And today, "change and decay?" Perhaps, but at least the old Deloraine Presbyterian Church still stands, serving another purpose; a monument, nonetheless, to faith - and good craftsmanship.